Men’s football receiver Kurleigh Gittens Jr. and women’s basketball guard Nicole Morrison were named recipients of the 2017-2018 President’s Award during Laurier's annual end-of-year athletic banquet. The President’s Award is presented annually to the university's most outstanding male and female athletes. Gittens Jr. became the third men’s football player in the past four years to win the award. The third-year receiver and returner had a season to remember for the Golden Hawks, setting a U Sports record for receptions in a season with 75, while also setting the Laurier record for receiving yards in a season with 953. The sociology major finished the year as the nation’s leader in all-purpose yards with 1,665 and scored seven touchdowns. A communications studies major, Morrison re-wrote the Laurier basketball record books during the past season. She started the year by setting a new single-game scoring mark with a 37-point performance against Queen’s before going on to set new team marks for most points in a season with 462 and most points in a career with 1,394. She also set two assists records, including most assists in a season with 105 and most assists in a career with 317. 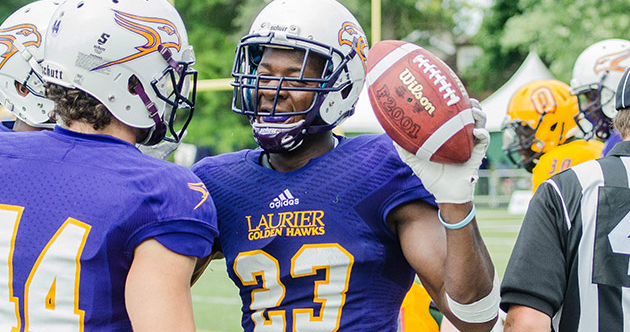 Three members of Laurier’s football team were selected in selected in May's 2018 CFL Draft. Defensive back Godfrey Onyeka was selected 10th overall in the second round by the Edmonton Eskimos. Onyeka, a U Sports First Team All-Canadian in 2017, was Edmonton's top draft choice. Laurier's Isaiah Guzylak-Messam, also a defensive back, was selected in the fourth round, 34th overall, by the BC Lions. Laurier's Godfrey Onyeka was selected 10th overall in the second round of the CFL Draft by the Edmonton Eskimos. Messam was named an OUA Second Team All-Star in 2017. Joining Messam in British Columbia will be defensive lineman Rashari Henry, who was selected 47th overall in the sixth round of the draft. 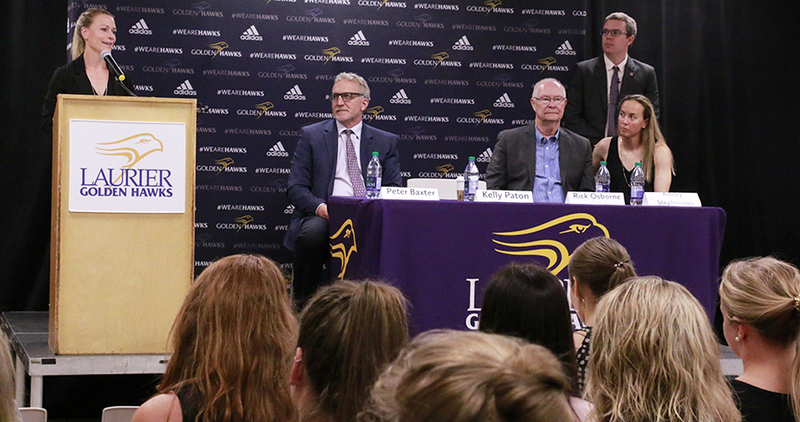 Laurier's Department of Athletics and Recreation introduced Kelly Paton as the new head coach and manager of women’s hockey operations during a May media conference. Paton, 30, joins Laurier following serving as head coach of the Western Mustangs for the past two seasons, leading the team to a U Sports silver medal this past winter. "I am very excited to be joining the Laurier Golden Hawks family,” Paton said. Kelly Paton was introduced as the new head coach of Laurier's women’s hockey team during a May media conference. Paton takes over coaching duties from Rick Osborne, who retired this year after 15 seasons behind the Golden Hawks bench. Golden Hawks women’s curling alumna Laura Crocker and teammate Kirk Muyres captured a medal for Canada at the 2018 World Mixed Doubles Curling Championship in May, defeating South Korea 8-3 in the bronze medal match. The medal capped off an outstanding year for alumni of Laurier’s curling program. Men’s curling alumnus John Morris and Brent Laing both represented Canada at the 2018 Winter Olympics, with Morris and partner Kaitlyn Lawes bringing home gold in mixed doubles. Alumna Danielle Inglis and Mike Andersen partnered to win the Canadian mixed doubles championship, while Laurier graduates Hollie Duncan and Cheryl Kreviazuk were part of a team that won the Ontario women's title before going on to represent the province at the 2018 Scotties Tournament of Hearts. Laurier's men's golf team played into the final day at Golf Canada's Canadian University/College Championship, finishing 10th out of 20 teams. This year's national championship was held from May 29 to June 1 at the Chilliwack Golf Club in Chilliwack, British Columbia. Individually, Austin Ryan finished tied for sixth at 4-under par to match the best individual finish by a Laurier golfer at the event.